White Collar Fraud: Open Letter to the Securities and Exchange Commission: Stop Overstock.com GAAP Violations Now! Open Letter to the Securities and Exchange Commission: Stop Overstock.com GAAP Violations Now! The Securities and Exchange Commission must take immediate action to require Overstock.com (NASDAQ: OSTK) to properly restate all financial reports affected by its accounting errors and stop the company from issuing any more financial reports that violate Generally Accepted Accounting Principles (GAAP). Enough is enough. In February 2009, I notified both the SEC and Overstock.com about how the company violated GAAP by improperly deferring the recognition of an accounting error to create a cookie jar reserve to inflate future profits. However, nothing was done to stop this illegal practice and Overstock.com's latest Q2 2009 press release and 10-Q report filed with the SEC violated GAAP, too. In this blog post, I will provide the SEC with a bullet proof case to take enforcement action against Overstock.com. On October 24, 2008, Overstock.com disclosed that it discovered customer refund and credit errors and restated all prior affected financial reports from 2003 to Q2 2008 to correct such errors. Those customer refund and credit errors resulted in an additional $8.2 million of accumulated losses in prior reporting periods. The customer refund and credit errors also caused Overstock.com to underbill its fulfillment partners for offsetting costs and reimbursements. While Overstock.com restated prior financial reports to correct its customer refund and credit errors, it failed to make such corrections resulting from underbilling its fulfillment partners as required by GAAP (See SFAS No. 154). In addition, Overstock.com failed to make a reasonable estimate of uncollectable underbilled amounts due from its fulfillment partners as required by GAAP (See: SFAS No. 5 paragraph 1, 2, 8, 22, and 23). Instead, the company improperly recognized income from such underbillings as they were recovered on a non-GAAP cash basis in future accounting periods (Q4 2008, Q1, 2009, and Q2 2009). 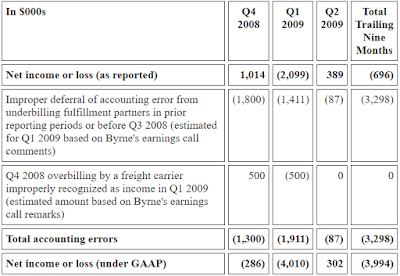 Notes to chart: In Q1 2009, Overstock.com disclosed yet another accounting error because a freight carrier overbilled the company "several hundred thousand dollars" in Q4 2008," according to remarks made by CEO Patrick M. Byrne during the Q1 2009 earnings call. For purposes of my analysis, I'll assume that the amount overbilled by the freight carrier is $500,000. 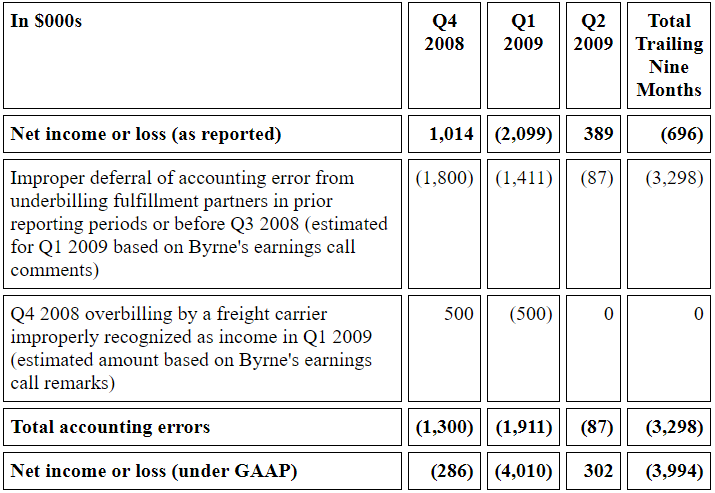 That overbilling error from the freight carrier partially offset Overstock.com’s improper recognition of income from its underbilling error to its fulfillment partners in Q4 2009. If Overstock.com would have properly followed GAAP in Q4 2008, the company (1) would have reported a net loss instead of a net profit, (2) would have reported sixteen consecutive losses instead of 15 consecutive losses, and (3) it would have failed to meet mean analysts’ consensus expectation for earnings per share (anyone of three materiality yardsticks under SEC Staff Accounting Bulletin No. 99 that would have triggered a restatement of prior year’s effected financial reports). Statement of Financial Accounting Standards No.5 requires Overstock.com to offset such accrued income in each restated financial period with a reasonable estimate of uncollectable underbilled amounts. The Securities and Exchange Commission’s interpretation of accounting rules is that “GAAP do not allow for the deferral of accounting adjustments arising from a change in estimate or the correction of error.” (Source: Cease and Desist order issued “In the matter of Carl M. Apel”). Accordingly, the consistent understating of results (i.e., conservatism) or overly optimistic estimates of realization (i.e., lack of conservatism or aggressiveness) are inconsistent with the characteristics of quality financial reporting needed for transparent reporting in today’s markets. In other words, conservatism cannot be used to understate profits or overstate losses. Overstock.com restated prior financial reports to correct its customer refund and credit error, but failed include in its restatement offsetting costs and reimbursements earned from its fulfillment partners. Therefore, Overstock.com violated GAAP by overstating losses from its accounting error. Those underbilling errors were improperly recognized as income as amounts were recovered in future reporting periods. As I detailed above, Overstock.com cannot defer recognition of any accounting error (See SFAS No. 154 and cease and desist order issued “In the Matter of Apel”). However, Overstock.com improperly failed to disclose any potential “gain contingency” in its prior Q3 2008 10-Q report, when it disclosed that it underbilled its fulfillment partners for offsetting costs and reimbursements (See: SFAS No. 5 Paragraph 17b). If there was any question as to the recovery of any amounts owed the company, management is required to make a reasonable estimate of uncollectable amounts (loss contingency) and book an appropriate reserve against amounts due from fulfillment partners. By immediately considering underbilled amounts due from fulfillment partners as a gain contingency, the company failed to make a reasonable estimate of such uncollectable amounts and violated accounting rules or GAAP (See; SFAS No. 5 paragraph 1, 2, 8, 22, and 23). The only way that Overstock.com could recognize income from underbilling its fulfillment partners in future accounting periods is if there was a “significant uncertainty as to collection” of all underbilled amounts (See SFAS No. 5 paragraph 23). As it turns out, a large portion of the underbilled amounts to fulfillment partners was easily recoverable within a very brief period of time: Q4 2008 $1.8 million, Q1 2009 $1.4 million, and Q2 2009 $78k. There was no “significant uncertainty as to collection” of all amounts underbilled fulfillment partners. Overstock.com's management had to know that the collection of significant amounts due from underbilling of its fulfillment partners was assured, contrary to its disclosure that "the recovery of such amounts was not assured, and that consequently the potential recoveries constituted a gain contingency." All you need to do is to follow the cash trail. When Overstock.com sells fulfillment partner inventory, customers promptly remit cash to the company. Afterwards, Overstock.com remits the portion cash proceeds due to its fulfillment partners for the inventory it sold to its customers. Initially Overstock.com gets to float cash that it receives from customers and is later required to pay fulfillment partners in up to 30 days. In addition, Overstock.com retains the right to offset various errors against future remittances to its fulfillment partners. Therefore, if the fulfillment partners are still doing business with Overstock.com, all that the company has to do is to withhold a larger portion of the monthly remittances from such fulfillment partners (up to a few months, if necessary) to recover underbilling errors. The greatest amount of the underbillings would certainly be attributable to its higher volume fulfillment partners who sold the most merchandise. Those high volume fulfillment partners are likely to be long time and current company suppliers of merchandise. Therefore, the ability to recoup a substantial share of previous underbillings to fulfillment partners can be reasonably estimated, as required by Statement of Financial Accounting Principles No. 5. In many ways, Overstock.com's recovery of underbilled amounts due fulfillment partners is far more certain than recouping money in credit card disputes from its average customers. The claim by the company that it immediately determined that a “gain contingency” existed improperly did not take into account subsequent material events as required by GAAP. Overstock.com is required to consider material events affecting the measurement or realization of assets in a financial report up to the date that either the final 10-Q report or 10-K report is filed with the commission (See: SAS No. 1 Paragraph 1, 2, 3, and 7 and Letter from SEC Chief Accountant entitled "Audit Risk"). In other words, if new information is received after the cut-off date that affects either assets or income in a financial report, a company must adjust its financial report to reflect that new information. In any case, even if we take Overstock.com at its word that it determined that a “gain contingency” existed when the “underbilling was originally discovered” that date of discovery had to be sometime after August 4, 2008, the filing date of Q2 2008 10-Q, and before October 20, 2008, the date that Overstock.com approved restatement of financial reports due to customer refund and credit errors (Source: 8-K report page 5). During Q4 2008, Overstock.com easily collected a total of “$1.8 million relating to payments from partners who were underbilled earlier in the year.” Overstock.com filed its Q3 2008 10-Q report 38 days into that quarter and clearly should have known by that time that significant amounts owed by fulfillment partners from underbilling them in the past was actually collectable and that no gain contingency existed as to such amounts. In addition, Overstock.com collected about $1.4 million in underbilled amounts during Q1 2009 and $87k in underbilled amounts during Q2 2009. If Overstock.com's explanation of a gain contingency is to be believed, the company improperly determined that a gain contingency existed when it first discovered underbilling its fulfillment partners, instead of spending any time trying to determine the recoverability of such underbilled amounts as required by GAAP. Overstock.com should have waited at least until November 7, 2008 (or 38 days into the fourth quarter) when it filed its Q3 2008 10-Q report before making a final determination as to the collectability of underbilled amounts due from fulfillment partners as of the end of Q3 2008. In fact, the company could have waited an additional seven days to determine the collectability of underbilled amounts due from fulfillment partners and still filed its 10-Q report on time. If management truly wanted to make a reasonable estimate as to the collectability of underbilled amounts due from fulfillment partners, Overstock.com could have properly filed a late 10-Q report by explaining the circumstances. It didn't. Apparently, management deliberately tried to avoid restating its financial reports for a third time in three years. In the three quarters after Overstock.com’s underbillings to fulfillment partners was discovered, the company was able to recover approximately $3.3 million. Overstock.com sought to only recover such underbillings from the year prior to discovering that accounting error. Originally, Overstock.com’s customer refund and credit errors added $8.2 million to accumulated losses reporting periods prior to Q3 2008. Of that $8.2 million dollar amount, $1.7 million of customer refund and credit errors occurred in Q1 and Q2 2008 (six months prior to discovery of the underbilling error). Those customer refund and credit errors, along with certain other revenue accounting errors added $3.0 million in losses to fiscal year 2007 (7 to 18 months prior to discovery of the error). Therefore, the gross potential amount of customer refund and credit errors occurring in the eighteen months prior to its discovery is about $4.7 million (Source: Overstock.com 8-K report dated October 24, 2008). Overstock.com collected about $3.3 million in offsetting costs and reimbursements from fulfillment partners who were underbilled because of those customer refund and credit errors. Overstock.com conservatively collected over 70% of underbilled amounts due from its fulfillment partners arising in the eighteen months prior to announcing its accounting error. The company only sought to collect such underbilled amounts for a period of only twelve months prior to the discovery of billing errors. Therefore, the percentage of recoveries was probably even much higher. Those calculations aside, the recovery of over $3 million of underbilled amounts to fulfillment partners within a relatively short period of time shows that substantial amounts were easily recoverable and could have been estimated. The only question was how long it would take for Overstock.com to recover such underbilled amounts. For the reasons detailed above, the Securities and Exchange Commission has a duty to require Overstock.com to restate all financial reports to properly reflect when income was actually earned from offsetting costs and reimbursements underbilled to its fulfillment partners. Otherwise, investors will continue to rely on financial reports issued by Overstock.com that violate GAAP. The Securities and Exchange Commission is cautioned not to take my freebies for granted any more, unless they want another Bernie Madoff embarrassment on their hands. All frauds ultimately implode and so will Overstock.com implode under the weight of its continued violations of GAAP and its management's lies to investors. Hopefully the SEC won't let this one slip through the cracks.